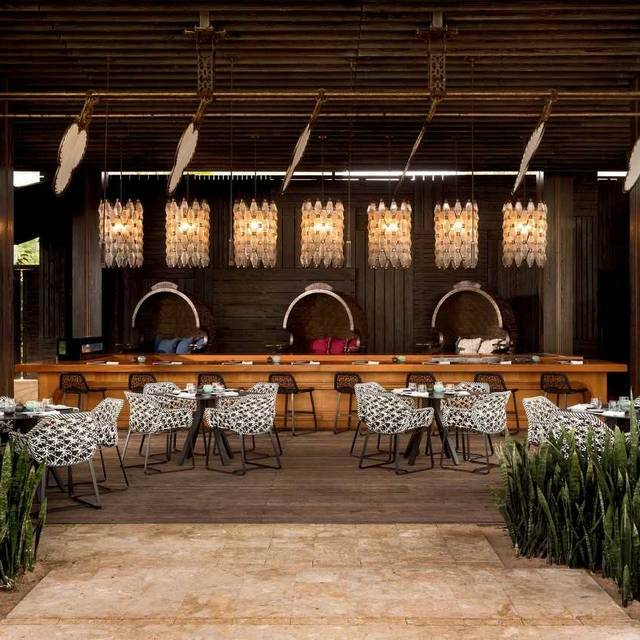 We invite our guests to enjoy a great selection of hand crafted specialty cocktails, and a unique selection of light fare food and sharing bites, while enjoying the unique views of Dorado Beach during the day. For dinner we entice you for an unique Sushi and Ceviche experience with other plates to share, appropriate for a friends gathering or a more intimate romantic dinner overlooking the ocean. We have been here twice before (before the big hurricane) so we were eager to return. Food was excellent though always pricey as it is on the Ritz Resort. One issue was the same: difficult to read those menus after sunset. Lighting is so low you need to use your phone to see what to order. The coconut shrimp roll is fantastic. Excellent service and an amazing view! Never disappoints! Always a consistent excellent experience. Difficult to explain its a must go!! The setting is beautiful. Beautiful ocean view and nice decor. The service is excellent. However, the food was not worth the price. It was ok but the great view and ambiance does not justify the price. We commend Positivo for converting the restaurant into one of the best Sushi/Asian Restaurant in Puerto Rico. Chef Suttiphan for making it right. Went there for a birthday celebration. 20 minutes to get water and drinks. Lighting in outdoor area was too bright. They agreed that it was way too bright but 3 asks to get it right. Wait staff distracted and annoyed but we don't know by what. Food very good but comes "when it is ready". Black miso appetizer came before dessert and we ordered it first. Sigh. This is our third time to this restaurant. We make it a must every time we visit Puerto Rico and stay at our time share which is almost next door to the Ritz Reserve in Dorado. First of all the setting is gorgeous right off the pool and right next to the beach and ocean. Part of the restaurant the tables are actually in the sand. The food is unique and very imaginative and delicious. We have not had one bad dish yet. Actually the first time that we went to the restaurant we were not too familiar with sushi but after having tried many things that evening we now love sushi. Most dishes are good for sharing so you can try many dishes. Highly recommend this restaurant if in the Dorado area of Puerto Rico. One of the best restaurants that we go. My wife and I loves tro eat in Positivo. Service, food, ambience, all of them are A+. We had a wonderful "last night of vacation" meal. There were four of us and we ordered a variety of menu items. From the sashimi , sushi rolls, ceviche, to the duck confit and dessert (rice pudding!) it was all outstanding. We loved our meal! The ambiance is lovely and the service impeccable. We would come back tomorrow if we weren't leaving the island. I highly recommend spending an evening at Positivo, you won't be disappointed. A fabulous dinner in a beautiful setting -- waves crashing star shining lovely cool lounge music. The food was very good -- fresh robataki and sushi excellent cocktails and attentive service. Romantic casual and chic. Great for sitting with feet in the sand and the most beautiful view - go at time of sunset to really enjoy! Food good but nothing special. Service not up to par for this level of restaurant- a lot of missed opportunities. One of the best restaurants in Puerto Rico. Positivo is positively our favorite restaurant on the island. They set the bar for how a Ritz Carlton property should be! This wasn't our first time there but since our first time the servers remembered us down to what we drank and ordered to eat. We were visited by the manager and chefs to welcome us back and ask how everything was. I can't begin to express the level of professionalism that every single person here displays, even the hostess remembers us and spoke to us by name as we walked up. If there is something better than first class, then Positivo is there. I don't have time to talk about the atmosphere but beachside at sunset creates a "happy heart" moment. Hotel restaurant. On the beach. Beautiful. Staff friendly, competent, motivated to make dining experience enjoyable. Food was great. From Chicago. Went on family vacation. Wife and three daughters ranging in age from 15 to 21. Everyone said it was their favorite dining experience. $18 parking fee with validation was a little surprising. But all in all great food and dining experience. Restaurant was classy; had a great view and the food was delicious!! If you can get a reservation please do!! Positivo is a very nice restaurant with a magnificent view where you can watch the sunset. Food is great and service impeccable. Our waiter, Christian, was very attentive without being intrusive! It is was our second time there and hope to go back soon! Excellent sushi and am amazing outdoor dining experience. with small tables and comfortable seats a bit removed from the rest of the restaurant. Perfect for our family of 6 with two young children. The small plates and sushi are varied and different and delicious. The tempura selections are out of this world. They had a very varied and different children's menu. The desserts also are delicious. The chocolate dessert was out of this world. We had a great dinner with our extended family. I almost forgot the view is out of this world and the ambiance is also terrific. You will not be disappointed. 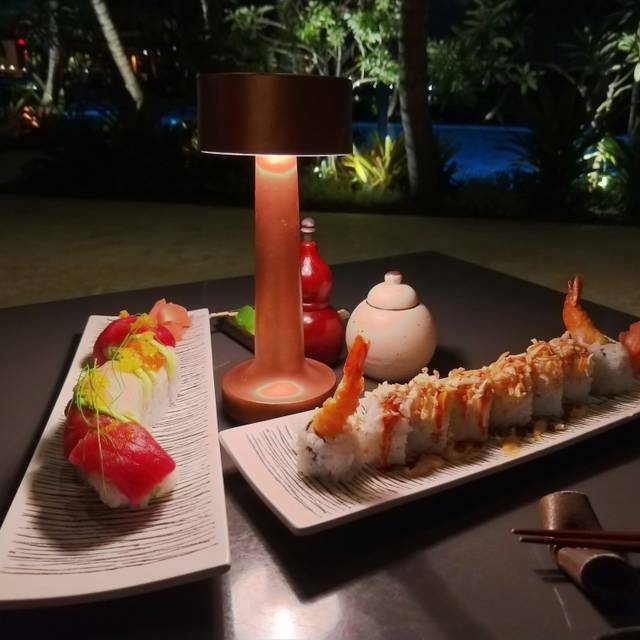 Since Chef Suttiphan took over the kitchen the Positivo Sand Bar the menu has become an amazing array of Fantastic Asian inspired dishes, fresh sushi, great innovative rolls and the best restaurant in the Ritz Carlton Dorado. Always, consistently amazing food. Atmosphere can't be beat. The tuna, hamachi and duck buns are my favorite items. Great Service and great food. The staff was very friendly and the food was super. No complaints at all. Will definitely come back. My wife daughter and I had Valentines dinner, had made reservations weeks in advance, but on arrival, told it was set menu, no idea about this until 7:00 pm at time of arrival. Limited menu with multiple dishes with shellfish, and unfortunately, I have shellfish allergies. This left fewer choice on set menu. It was price fixed menu, and we had few choices as to other dinning options, considering it was Valentines Day. Poor communication was the problem, and left us with few options, just like the menu. To add insult to injury as we entered the restaurant area, we told about the menu, it was dark out, and handed a menu without any light to read it. I felt asking for other reservation to eat at 7:00 was not realistic or fair for the hotel to come up with on short notice, to bad the restaurant did not have same consideration. Despite this still had a fairly enjoyable evening. Food was marginal, but I would not have chosen any of the items offered if I were selecting my own meal. Wonderful food and service. My favorite place in Dorado!!!!! Best place ever! A+ in food and service. If you want to have a great time and outsanding food you need to reserve and go!!!!! If you are looking for creatively prepared fresh fish served in a beautiful outdoor setting you need look no further . This was by far one of my top 10 favorite meals . Table was literally in he sand with the ocean just yards away . Creative cocktails and excellent service . Can't wait to to back!! We went to Positivo last week for the first time. It won't be the last. We arrived at 6:00 pm and we were able to watch the sun set into the ocean. It doesn't get much better than that. We ordered appetizers , ceviche, duck skewers, skirt steak and red snapper. They were all delicious, with red snapper being the favorite. We then shared an order of tempura shrimp. Once again, it was delicious. We ended the evening with several orders of makii, probably the best sushi we have eaten. Our waiter was personable and attentive. The chef even made an appearance to our table. It will be difficult to eat anywhere else in Dorado. Positivo has set the bar very high!